A new NYPD counter-terror plane is capable of detecting a potential dirty bomb from the air. Jonathan Dienst reports. The NYPD has recently unveiled its newest asset: an airplane with radioactive detection capabilities. 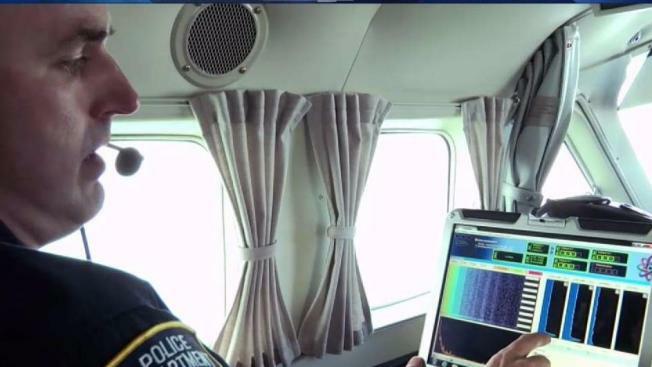 The NYPD Counterterrorism Bureau plane can fly 200 nautical miles scanning for dirty bombs -- homemade explosives loaded with a radioactive source. The I-Team was given exclusive access to a practice run, searching for a radioactive signal, highlighting just how sensitive technology is on board the airplane. In the mock scenario, NYPD sent out one of its own boats, armed with a source of radiation. “We’re looking for a signature of various types of isotopes which are commonly used or could be used in the production of a dirty bomb,” said James Coan, the commanding officer of the NYPD’s aviation unit. Within minutes, the plane scanning the Hudson Bay picked up the hypothetical threat. "When you’re out on the water your levels of background radiation are pretty low," said Officer Daniel Hogan. "So you see any radiation pretty clearly." Hogan is part of the crew taking daily flights that depart from an undisclosed location in New York City. The plane can fly for up to six hours scouring cargo vessels, yachts and other ships from Massachusetts to the southern end of New Jersey. "This asset gives us the capability to expand… so that we could identify a potential threat a day before it gets here," Coan said. According to Coan, ISIS continues to encourage low-tech attacks in its war against the United States. Recently, vehicle-related attacks are the weapon of choice. But while truck or van attacks like the ones in Nice, France, in July 2016 and London in June remain a concern to NYPD, intelligence officials say terrorists continue to try to get their hands on a dirty bombs. "They are relentless," he said. "They’re not giving up, they want to destroy our way of life." If the plane does detect a potentially dangerous source of radiation, Coan said the team can respond by working with local, state and federal agencies. "The pilots upfront are not only in communication with air traffic control, they’re also in communication with NYPD communications as well as the Coast Guard command and control center," said Coan. He added, "If they identify a potential threat, they can start a response immediately." The plane is also used to help the police department with search and rescue. The on-board cameras can track criminal suspects from a far distance without police being discovered. And although the plane can help fight crime, its crew members and the latest technology built into NYPD’s newest aircraft have one priority: prevent terrorists from attacking New York City. "The threat is real," Coan said. "Our job is to make sure that they’re not successful."